There are many pieces to the PA school application, including your GPA, GRE score, personal statement, list of experiences, letters of recommendation, and biographical information. Use the navigation below to explore each aspect of preparing for physician assistant programs. Physician assistants (commonly known as PAs) provide health care under the supervision of a physician. The scope of practice for PAs varies state to state, but in general a PA can take medical histories, examine patients, order and interpret laboratory tests and x-rays, and make diagnoses. They also treat minor injuries by suturing, splinting, and casting. PAs may also prescribe medications under the supervision of a physician. PAs specializing in surgery can provide pre- and post-operative care and may work as first or second assistants during major surgery. PA’s obtain a master’s degree in Physician Assistant Studies. See the AAPA's "What is a PA?" to learn more about this profession. PAs can work in any specialty in medicine, including surgery, emergency medicine, oncology, and more. Many PAs will switch from one specialty to another over the course of their careers. * Each school has different prerequisite coursework. Please check with individual schools to ensure you satisfy their prerequisite coursework. See the Physician Assistant Program Prerequisite Chart for a sample list of PA programs and their requirements. Note that pre-requisite courses may be taken at an accredited community college or four year university. You can choose any major and apply to PA school. Even if your major does not require certain prerequisite courses for PA programs, you are still required to take them for admission to that school. Always cross-check your major requirements and the medical school requirements when choosing classes. Some PA programs require you to have your prerequisites done before you apply, while other programs want them done before you start the program. See HPA's California PA Program chart for more information. Not required by all PA schools. As of December 2018, only 3 PA programs in California required the GRE (Stanford University, Chapman University, and University of Southern California) and only 1 PA program recommends it (Dominican University of California). Available on a continuous basis throughout the year. Register for the GRE here. $160 each time you take it. Asking, "Will this look good on a PA school application?" is the wrong way to approach your experience at UC Davis. PA schools will see who you are and what you care about through experiences that align with your interests, goals, and passions. Whatever you choose to do, be sure you are dedicated, passionate about it, and motivated to pursue it for the right reason! Click here to see a powerpoint with more information about finding PA Experiences. The CASPA application cycle opens in April and will closes in May. It is very important that you read the CASPA Instructions & FAQ before starting your application. You are responsible for knowing this information before you apply. The initial cost for CASPA is $175 for the first program you apply to. Any additional programs you choose to apply to will cost $50 per school. All programs you apply to will see the same personal statement. Once you submit your CASPA application, you cannot update or edit your personal statement. CASPA allows you to submit 3 - 5 letters of recommendation, also called evaluations. Letters must be completed within CASPA at the time of your application. CASPA will not accept letters from Interfolio or other letter services. Your letter writers will also complete a questionnaire in which he or she evaluates you on a scale of 1–5 in regards to several different criteria. See CASPA’s How to Submit a Letter of Reference for more information. Some secondary questions are embedded in CASPA and sometimes sent later in supplemental applications, school-specific applications. Each school has a different supplemental application - some schools might ask you to complete additional short essays or a questionnaire, or they could ask for a resume or a headshot. Usually supplemental applications include a fee that can range from $50 - $100. Some PA schools include interviews in their admissions process, while others do not. 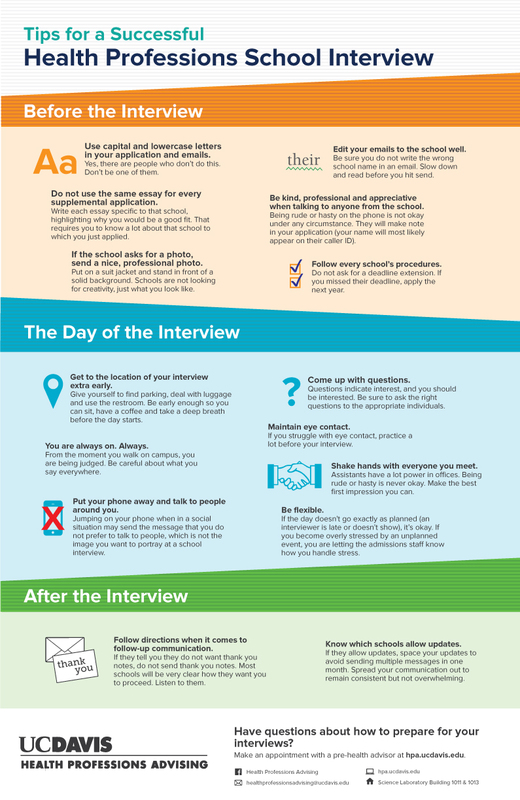 Interview styles vary by school and may include one-on-one conversations, panel interviews, and/or multiple mini interviews (MMI). There are over 200 accredited PA programs in the U.S. and many more in the process of becoming accredited. See the ARC-PA list of programs. There are a variety of factors that go into choosing which PA programs to apply to, including location, environment (i.e. urban), tuition, class size, focus or mission statement, etc. Spend some time researching schools online and create a spreadsheet that tracks the factors most important to you. HPA also recommends meeting with an advisor to discuss your school list. Choose a major you are passionate about. You can pursue any major, from biochemistry to music, and apply to PA school as long as you complete the school prerequisites. PA programs review applications holistically, and your major is just one small piece of your story. What courses satisfy the English requirement for PA schools? Lower and upper division English (ENL), UWP, and Comparative Literature (COM) courses will satisfy the English requirement for PA schools, unless a school website says otherwise. You may also take similar classes at a community college. Note: Testing out of the upper division UWP course requirement via the Upper Division Composition Exam (UDCE) for graduation does not count towards the PA school requirement. Which classes count towards my science GPA? You can see which courses count towards the science GPA calculated by CASPA here. Do PA programs accept AP credit? PA programs are not consistent in how they handle AP credit. Some programs may allow you to use AP credit to fulfill certain prerequisites, while other programs might not accept it at all. HPA recommends that you take college-level coursework for all prerequisites. Do I have to complete all of the prerequisites before applying? Some PA programs, such as UOP, require that all of your prerequisites be completed at the time you submit your CASPA application. Check each school's website that you plan on applying to see their policy. UC Davis does not offer a Medical Terminology course. How do I complete this prerequisite? Many community colleges offer medical terminology courses as part of their Allied Health coursework. For example, American River College and other Los Rios District Community Colleges offer AH 110: Medical Language for Health-Care Providers (3 semester units). See the Los Rios course catalogs here. Do HRI internships count as Patient Care Experience? It depends on what responsibilities and duties you have during the HRI. If you are mostly involved with administrative duties or have no patient contact, then most PA programs probably won't accept that for the Patient Care Experience. You can still include these HRI's on your CASPA application as Health Care Experience. Can I include experiences from high school? "You may include any experience you believe is relevant to your PA application. However, it is preferable to focus on experiences from the last 10 years and which began at least at a collegiate level." The personal statement should be a reflective, well-polished document. You can create your first draft as soon as you want. The more time you give yourself to get feedback and revise the better. Health Professions Advising advisors are happy to read your essay and give you feedback, but please make the appointment at least a month before your deadline. When should I submit CASPA? "Apply early! To ensure your application is verified on time, ALL MATERIALS should arrive at CASPA to complete your application at least four weeks prior to your earliest deadline. Once your application is considered complete, it can take up to FOUR WEEKS for it to be processed."